Derry are one step closer to safety. Derry took a major step toward Division Three safety with a routine victory that relegated a poor Wexford side in Celtic Park on Sunday. With Sligo's meeting against Offaly postponed, Damian McErlain's men knew nothing could be mathematically rubber stamped until at least Monday when the re-arranged game will take place but should Sligo win, Derry's better head to head record against Offaly will mean the Oak Leafers are safe with one game to spare. And there was never really any doubt Derry would get the two points they needed in a game in which any trouble the home side had were mainly created by themselves. Always in control, the home side switched off at times and while never really in danger off being reeled in, a better side than Wexford would have taken advantage and conceding three goals will concern McErlain and his backroom team. Derry made four changes from the defeat to Armagh in the Athletic Grounds with Peter Hagan and Niall Toner joining Slaughtneil pair Karl McKaigue and Padraig Cassidy in the starting line-up and it was Cassidy who made the immediate impact. Roaming forward from the half-back line, Cassidy was both play-maker and driving force as the Oak Leafers built an seven point first half lead against the considerable breeze. With Division Three survival on the line for both teams, a quick start was essential to grab a foothold in the game and it was the home side who seized the initiative with Cassidy and Conor McAtamney superb for a Derry side whose movement Wexford struggled to contain in the opening quarter. McAtamney got the game's first point before seeing his shot touched over the bar by Benny Heron for an early two polint lead. That was all after a first minute Wexford free from Barry O'Connor had been inexplicably left by the home defence with only the width of a post stopping a goal for the visitors. Eoghan Nolan did tap over a reply for Wexford but by the 11th minute, Derry had hit another 1-2 to lead 1-4 to a single point. Padraig McGrogan was enjoying a good game in defence for Derry, mopping things up in front of the full-back line but he showed the offensive side to his game with a superb goal on nine minutes. Again Cassidy was central, picking out Lynn who in turn fed McGrogan marauding forward. He stepped inside, sized up the goal before flashing a lovely finish past Conor Swaine. Enda Lynn got himself on the end of a flowing Derry move to point seconds later to put the Oak Leafers firmly in control. That control was being tested by Wexford's Barry O'Connor who was single-handedly trying to keep his team in the game and was the game's dominant player for the second quarter. Barry O'Gorman and Glen Malone grabbed points before Cassidy split the posts at the other end with Mark Lynch then tapping over two frees for a 1-07 to 0-3 lead on 17 minutes. Then O'Connor took over. Three successive scores, brought the visitors to within four points before he broke through the Oak Leaf rearguard and teed up Robert Frayne to go clean through but the half-forward pulled his low shot inches wide. Another McAtamney point was cancelled out but an outrageous O'Connor score before Derry crucial second goal arrived a minute before the break. A superb run by Bradley took him along the left touch line. He cut inside and found Lynch whose return touch took a touch off a defender and looped up in the air for Bradley to punch past the hapless Swaine and give the home side a huge boost as they turned around with the wind at their backs. The benefit of the wind was evident within 12 seconds of the restart as they won the throw-in and Emmett Bradley strode forward to tap over. In contrast, Wexford were struggling gauge the wind at the other end with three poor wides inside the opening minutes hindering any chance they had to get a foothold in the game. McGrogan, Lynch, (free) and McAtamney all grabbed points, the latter tapping over when Kevin Johnston was free metres from the goal inside him but 2-12 to 0-7 still looked a commanding lead. That security took a hit on 47 minutes when Wexford hit an unlikely goal from a counter attack, Derry caught with numbers upfield as Eoghan Nolan passed to Shane Doyle who produced a lovely finish into the far corner for 2-12 to 1-07. Wexford were handed another major boost with an early contender for the most ridiculous penalty decision of 2018. Wexford substitute Paul Curtis cut inside to have a shot with struck McGrogan on the thigh from only a metre away. No one was appealing but Leitrim referee Eamonn O'Grady somehow seen it as a foot block to the consternation of Derry. Up stepped Naomhan Rossiter to send McKinless the wrong way and Wexford were only five points down at 2012 to 2-07. But perversely, any thoughts of a Wexford comeback ended with that contentious penalty. Derry response was emphatic as Lynn, McAtameny (2), Toner and Shane McGuigan all pointed to make the game safe. Worrying, Derry fell asleep again to allow Curtis to bundle home a third Wexford goal after Curtis' effort had hit the post but it was never going to be enough to save Paul McLoughlin's men from the drop to Division Four, even when a second yellow card meant the dismissal of the impressive McGrogan. Derry had scores in them when they needed them and further points from Terence O'Brien and Toner emphasised the gulf between the teams but Derry's tendency to sit back and invite pressure is a trait they will have to address for the bigger challenges that lie ahead. 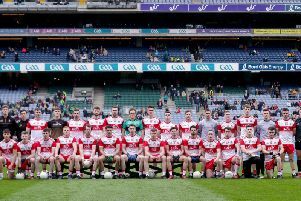 Derry: Ben McKinless; Ruairi Mooney, Kevin Johnston, Conor McCluskey; Karl McKaigue, Carlus McWilliams, Peter O'Hagan; Conor McAtamney (0-6), Emmett Bradley (1-1); Enda Lynn (0-2), Benny Heron (0-1), Padraig Cassidy (0-1); Padraig McGrogan (1-1), Mark Lynch (0-3, 3f), Niall Toner (0-2). Wexford: Conor Swaine; Conor Carty, Jim Rossitter, Michael Furlong; Glen Malone (0-1), Naomhan Rossiter (1-0, 1pen), Shane Doyle (1-0); Nick Doyle, Barry O'Gorman (0-4, 1f); Eoghan Nolan (0-1), James Stafford, Robert Frayne; Barry O'Connor (0-1), Alan Nolan, John Tubritt.